Ryther is a children's behavioral health services institution which has been under increasing financial pressure due to diminishing public funding. Though historically Ryther primarily treated foster children, it recently expanded its reach to private insurance clients, simultaneously securing its financial future. Ryther is now a provider which can serve any child or family that needs help with the wide range of issues wherein it is uniquely qualified. To facilitate this transition, Ryther embarked on a major fundraising initiative to renovate the campus. 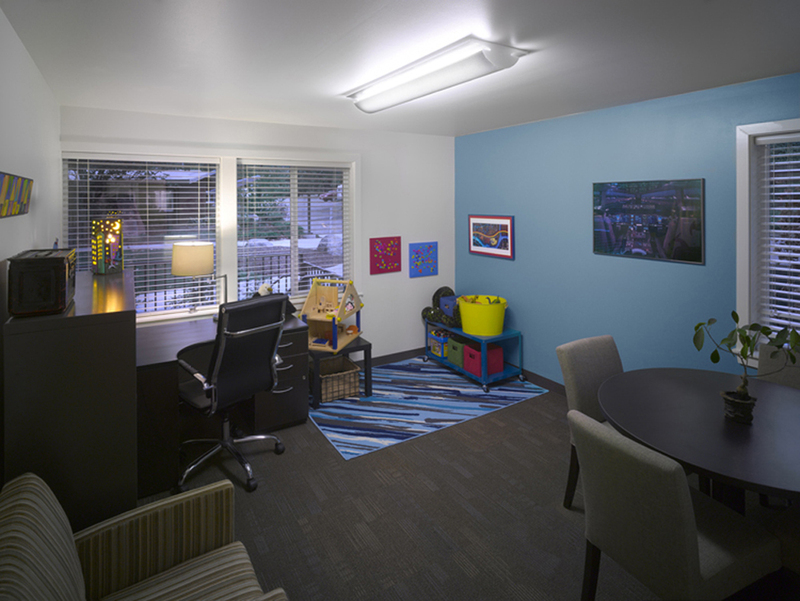 Our task was to transform a fairly non-descript institutional campus into a place that is professional, highly functional, and expressive of its unique nature, namely that Ryther is a mission driven institution, dedicated to healing families and helping children realize a better life. 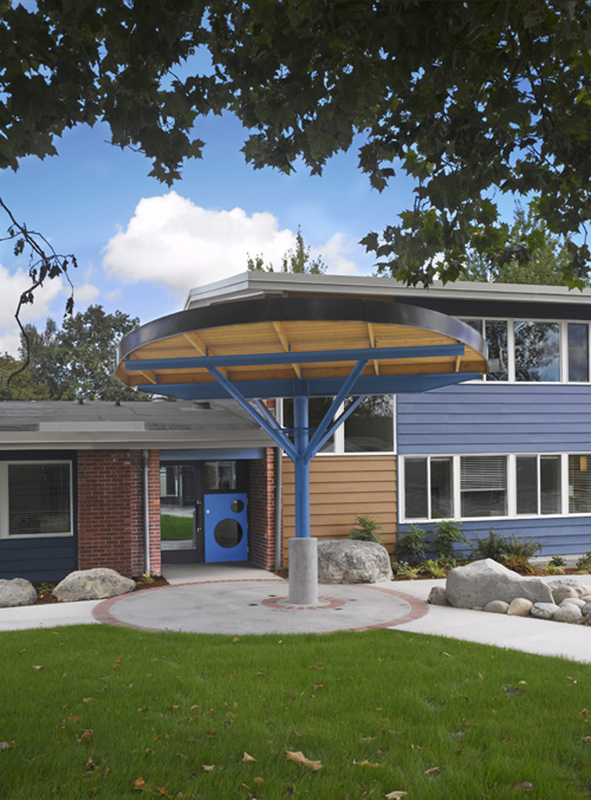 The resulting design is welcoming to children, while also instilling confidence in caretakers. Throughout the process we looked for opportunities to express the child-centered mission of the institution through architectural form. For example, the existing grey paint color of the campus buildings felt cold. Now each major building on campus has brighter, kid-friendly colors that complement the 1960s era brick. A new colorful entry canopy provides way-finding and sets the tone for the campus, using a mixture of gestural elements, cheerful colors, and playful shapes. 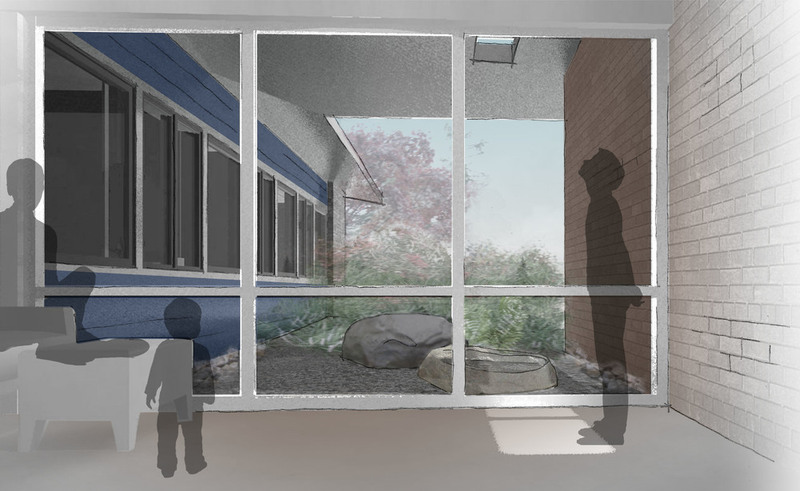 Elements such as a kid-sized entry door, lobby portal wall and wave mural invite children to imagine and play—to feel like children again.